Young backpackers learn map and compass reading during a Tahoe Rim Trail trip. 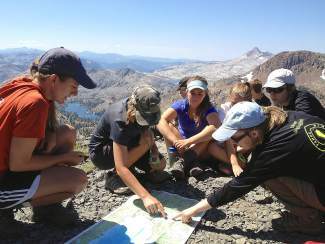 TAHOE, Calif. — The Tahoe Rim Trail Association, the Tahoe Institute for Natural Science (TINS), and the American Red Cross are partnering for their seventh annual Youth Backcountry Camp summer program season. Teens ages 12-17 are invited to attend three or five-day programs for inspiring wilderness experiences. These programs are an opportunity for teens to make new friends while learning about Wilderness First Aid (WFA), leadership skills, navigation (map/compass), Leave No Trace wilderness ethics, ecology and geology, wilderness tracking, and backcountry cooking and nutrition. Participants will backpack approximately 3-7 miles per day while participating in learning activities. YBCC Wilderness First Aid (five-day), ages 15-17, July 6-10, $375. YBCC Tahoe Trackers! (three-day), ages 12-14, July 20-22, $240. Gear, food and transportation will be provided for all participants. All programs are instructed by experienced and well-trained staff from the TRTA, TINS and American Red Cross. Scholarships are available. To determine eligibility and for more information contact Mikenna by phone 775-298-4493 or email programs@tahoerimtrail.org. Online registration can be completed at http://www.tahoerimtrail.org.